The risk for humans to contract bovine tuberculosis through the consumption of undercooked game meat as well as biltong (traditionally dried game meat) is a concern. The survival potential of Mycobacterium bovis during the cooking and drying processes was researched in a preceding study on beef and the positive results compelled the authors to investigate the results with a similar preliminary study on game meat. Muscular, lymphatic and visceral tissues from skin test positive African buffalo (Syncerus caffer) and greater kudu (Tragelaphus strepsiceros) with tuberculous lesions were collected from the Hluhluwe iMfolozi Park during the park's culling programme. The different tissues were exposed to cooking and the muscular tissue to the drying process prior to culture. All acid-fast isolates were analysed by polymerase chain reaction for the presence of Mycobacterium bovis. All tissues were found negative for Mycobacterium bovis but non-tuberculous mycobacteria were isolated from kidney, liver, heart and lymph nodes. The results showed that these processes will kill Mycobacterium bovis but the unexpected recovery of non-tuberculous mycobacteria suggests possible survival and resistance characteristics of these strains which might be of veterinary public health interest. Keywords: African buffalo, cooking, drying, kudu, Mycobacterium bovis, non-tuberculous mycobacteria, NTM, zoonotic risk. Game farmers in South Africa have progressed from world leaders in extensive sustainable utilisation of game species to fully fledged suppliers of game meat, both to the local and international meat markets6,24. Game meat not only from private game farms but also from national parks and reserves is made available on the market for human consumption10. It has been noted that the risk of contracting tuberculosis is increased by the intake of game meat not subjected to meat inspection, eviscerated material and inadequately dried or cooked meat3. This may be a problem especially in poorer communities, as they often obtain their meat from uncontrolled sources. Although the presence and spread of Mycobacterium bovis has been extensively researched and monitored, especially in the African buffalo (Syncerus caffer) population in South Africa, the risk for humans to contract this zoonotic disease through consumption of cooked or dried meat and organs from infected game animals (tuberculin skin test-positive African buffalo and kudu with characteristic external signs of M. bovis) is currently unknown16. Diagnostic isolation and molecular characterisation of M. bovis in game only began in 1991 in the Kruger National Park and the pathological lesions caused by M. bovis have not been well documented in many wild animal species18. Game lodges and restaurants in South Africa serve game meat dishes ever more frequently, promoting the 'African experience'11. However, a cause for public health concern is the potential zoonotic importance of M. bovis in game meat, as pointed out by previous authors14,17. The authors of a recent review concluded that disease can be caused by various species of the genus Mycobacterium and that some of the unusual species have probably caused disease episodes, but could have been misdiagnosed32. They furthermore stated that M. bovis could be a far more serious pathogen than some of the other mycobacterium strains. Tuberculosis and other, non-tuberculous mycobacteria (NTM) are among the most serious complications in HIV-infected individuals and, against the background of the soaring HIV/TB co-epidemic in southern Africa, the public health risk of both tuberculous and non-tuberculous mycobacteria in immuno-compromised individuals must not be underestima ted7,21,29,32 . It is currently unknown how many tuberculosis cases may be due to M. bovis and the veterinary profession in southern Africa has an obligation to identify and minimise the risk from sources relating to animals and their products. The question that therefore needs to be answered in the light of the globally escalating consumption of game meat and the presence of M. bovis in wildlife is: What is the risk of transmission of M. bovis to consumers of cooked and dried meat from M. bovis-infected African buffalo and kudu? A similar study conducted as a pilot study of beef preceded this study, and with experimentally inoculated meat and organs the authors found that M. bovis was able to survive the cooking process31. The present study therefore aimed to determine whether naturally infected game meat poses similar risks. The research formed part of the bovine tuberculosis management programme of the Hluhluwe iMfolozi Park in the KwaZulu-Natal province of South Africa, as part of which between 40 and 80 buffalo per selected African buffalo herd were captured in a mobile boma and tested for bovine tuberculosis using the intradermal tuberculin test (D Cooper, KwaZulu-Natal Wildlife, pers. comm. 2004). Following immobilisation of the buffalo with a combination of etorphine hydrochloride (M99, Novartis South Africa) and azaperone (Stresnil, Jansen Pharmaceutica), applied by means of pole syringes under veterinary supervision, all African buffalo were marked with numbered ear tags and hot-branded on the top of the rump. Immobilisation was reversed using diprenorphine (M5050, Novartis South Africa) and the animals were kept in the boma for 3 days. Test-negative buffalo were released as a herd and skintest-positive African buffalo were culled, after the 30-day withdrawal period allowed for M99 and M5050, and examined for tuberculous lesions in the abattoir in Hluhluwe iMfolozi Park by qualified meat inspectors under supervision of the Park's veterinarian. Greater kudu (Tragelaphus strepsiceros) in the Hluhluwe iMfolozi Park with visible, characteristic abscessation of the parotid lymph nodes consistent with previously reported findings14 were assumed to be infected with M. bovis and were culled at night with head shots during a routine disease surveillance programme and followed up by meat inspection as was performed on the buffalo at the abattoir. A sample of at least of 20 g of each of the following tissue types: muscle (diaphragm), kidney, liver, heart, lung and lymph nodes (mandibular and parotid) were collected by veterinary staff from each of the carcasses of 7 African buffalo and 7 greater kudu with tuberculous lesions (n = 112) at the meat inspection point. For every carcass, an additional sample was taken from the muscle tissue to allow for the drying process experiment. These specific tissue types were used for the following reasons: muscular tissue is commonly used in game meat recipes and in game biltong, which is a highly valued edible commodity in Africa (C. Steynberg, Wildlife Ranching South Africa, pers. comm. 2004); high consumption index of these organs and tissues in gourmet restaurants10; availability and accessibility of the tissue; and the organs selected are known target tissues of M. bovis2. The utensils were sterilised between samplings in a steriliser at the inspection point at 82 ºC for 20 min27. Samples were then placed in separate sterile plastic bags (Whirlpack), labelled accordingly and placed on ice in an insulated cooler box (7 ºC) for transport. At the ARC-Onderstepoort Veterinary Institute Tuberculosis Laboratory, samples were frozen to -18 ºC (without compromise to M. bovis) within 4 hours and stored until analysed26. Two different cooking times of 10 and 20 min respectively were applied to the samples in the laboratory, according to the method described previously30. The biltong-making entailed cutting meat strips, curing them (12-18 hours) in a standard game biltong mixture of salt, sugar, vinegar and spices and subsequent drying (reduction of aw) (C. Steynberg, Wildlife Ranching South Africa, pers. comm. 2004). All of this led to a stepwise effect of preservation (salt, sugar, pH and drying) as more than 1 preservation barrier is used to inhibit microorganisms20,23. The buffalo and kudu muscle samples were prepared by defrosting in a class II biohazard cabinet, examined macroscopically and the findings regarding size, abnormal consistency, colour and the presence or absence of visible lesions in the samples recorded. The samples were trimmed of fat, cut into 20 g pieces using sterilised instruments and placed in sterilised earthenware containers. The muscle tissue (20 g of each of the 14 animals) was placed in the biltong mixture, as previously described, for 12 hours, and then hung in a biohazard cabinet (class II) for drying. The prepared samples were cooked at 100 ºC in 150 mℓ sterile distilled water for 10 min in earthenware containers and then divided into 2 equal-sized portions using sterilised scissors. One of these samples was cooked for a further 10 min. A control container with a thermometer on the hot plate inside the biohazard cabinet was used to record that the temperature at which the samples were cooked was kept at 100 ºC. Following cooking for 10 and 20 min respectively, the samples were cut into smaller pieces and homogenised for 3 min, together with the dried muscle tissue samples, at 5000 rpm in the Servall omni-mixer (Ontario, Canada). All methods for processing including decontamination of the samples were used according to the pilot project on beef muscle and organs31. A total of n = 792 slants were prepared and incubated for both the cooking and drying processes and were monitored weekly for growth. After 10 weeks, observed colonies were stained with Ziehl-Neehlsen stain and acid-fast isolates were subjected to Mycobacterium tuberculosis complex specific polymerase chain reaction (PCR)4. This primer set amplifies a 372 base pair product within the MPB70 region of M. bovis. All PCR negative isolates were defined as non-tuberculous mycobacteria (NTM). A pooled control was prepared from muscle and visceral tissue respectively from both buffalo and kudu samples without subjecting them to the secondary processes of cooking and drying but otherwise processed for analysis in the same way as the test samples. The pooled muscle and visceral tissues were the control for the cooking process and the pooled muscle tissues for the drying process. 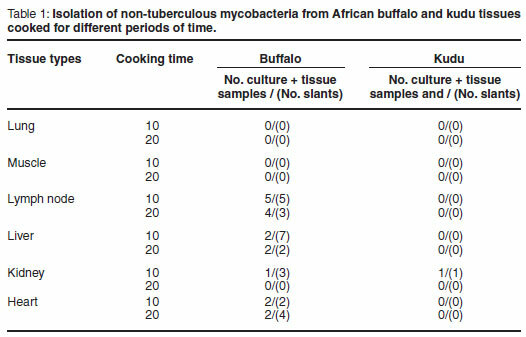 No mycobacteria were isolated from any of the 14 tissue samples from African buffalo and kudu that were exposed to the biltong-making process (drying). However, colony growth was observed on the untreated pooled control muscle tissue sample (not subjected to the biltong making process) and was confirmed by means of the PCR test as M. bovis. M. bovis but all isolates were diagnosed as NTM9,21. The pooled control sample (mixture of buffalo and kudu tissue not exposed to the cooking process) yielded growth which was confirmed as M. bovis by means of the PCR test. While no Mycobacterium spp. were isolated from the cooked lung and muscle tissues from either buffalo or kudu, NTM were detected in kidney, liver, heart and lymph node tissue samples from 4 of 7 buffalo and 1 of 7 kudu from kidney tissue. All culture results are summarised in Table 1. The tissue types are differentiated in column 1 and the 10 and 20 min cooking times in column 2. The number of positive slants in relation to the number of culture positive tissue types they were prepared from is illustrated in column 3. Non-tuberculous mycobacteria were isolated from 4 kidney samples, 9 liver samples, 8 lymph node samples and 6 heart tissue samples from buffalo and 1 kidney sample from kudu. In all tissues yielding NTM, except for the heart, the number of culture-positive medium slants was higher for samples cooked for 10 min as opposed to 20 min, with in total 18 culture (mean 3.0) positive medium slants for samples subjected to the 10 minute cooking period versus 9 medium slants (mean 1.5) for the corresponding 20-minute cooking period. These results suggest that cooking time had some effect, although not statistically significant, on the recovery rate of these NTM. The tissue types (P = 0.0183) played a significant (P < 0.05) role in the survival of NTM. A significant difference (P = 0.05) in NTM was observed between the different animal species (buffalo and kudu) (P = 0.0001). It should, however, be noted that this study focused on only 2 species and different results may be obtained with the inclusion of more species. During this study various organ tissue samples from known M. bovis-infected African buffalo and kudu were processed by cooking or drying in order to determine the zoonotic risk for transmission of M. bovis to consumers of these products. The findings of this study indicate that the food processing protocols applied were able to kill M. bovis in tissue samples examined from both buffalo and kudu. In comparison with the previous study conducted by the authors on beef, which demonstrated the survival of M. bovis on some of the experimentally inoculated tissue (indicated by 17 of 576 slants yielding M. bovis colonies), the present study showed no survival of M. bovis in the naturally infected game samples. However, NTM were isolated on 27 of 792 slants. As with the study on beef, the results obtained for producing game biltong (dried meat) suggest that biltong dried to contain minimum residual moisture does not support the survival of Mycobacterium spp. including M. bovis. Again, as with the previous study31, the small pieces of meat used and the penetrating, drying efficacy of the flow cabinet could have resulted in an unusually low moisture content and hence a water activity, aw, (amount of moisture available to bacteria in food) well below 0.95 aw which is not tolerated by M. bovis5. This experiment, therefore, could potentially yield different results when a natural drying process is used, especially if it results in very moist biltong. Furthermore, PCR was not applied for M. bovis confirmation on all pooled control samples but the abattoir confirmation of M. bovis lesions by the Park's veterinarian and the positive result of the pooled control sample that was tested by PCR motivated the conclusion from the control test. There was no significant difference in the effect between the different times of exposure (10 and 20 min of cooking, respectively). Although it has been stated that the composition of the substrate in which the bacteria are heated will determine the time needed to destroy the bacteria8, this was not confirmed by either of the studies. While no M. bovis was isolated, the detection of NTM in 4 of 7 buffalo as well as in 1 of 7 kudu was an unexpected observation. Owing to the specific purpose of this investigation to determine the survival of M. bovis, species identification of NTM, which involves costly PCRsequencing techniques not readily available in all laboratories, was beyond the scope of this study. However, when assessing the zoonotic risk posed by game meat, it is of crucial importance to highlight the potential of some of these NTM, although currently uncharacterised, to survive in food after cooking. Most NTM, many of which are still uncharacterised, occur in the environment and were believed to be non-pathogenic or only opportunistic pathogens in humans, but this has changed as a result of recent research31. Disseminated NTM infections in HIV-positive patients (individuals with immunosuppression21,22) have been reported from different countries1,7 and highlight the potential zoonotic importance of these mycobacteria in South Africa where recently 5 new species have been found from human samplings alone (P van Helden, University of Stellenbosch, pers. comm. 2009). The significance of the tissue types in the recovery rate of NTM from the same animals was similar to that found in the beef study31 and in this study different possible explanations are considered, all of which influence the zoonotic risk of consumption: a) some tissue types are prone to colonisation by certain NTM species, and b) some tissue types protect NTM during the process of cooking better than others, which may be linked to the fact that core temperature during the cooking process is reached more rapidly in lung tissue than in the heart muscle owing to the low density and delicate consistency of the tissue11,16. It could therefore be argued that for all practical purposes the exposure time of the organism to heat was shorter in the heart muscle (survival of NTM in heart tissue cooked for 20 min) than in the lung and moreover too short to show a bactericidal effect at all. This phenomenon that occurred during the study on beef supports the negative culture results for the lungs of all animals (both bovine and game). In the case of the muscle tissue, the diaphragm was very thin and the core temperature was reached more rapidly, as the thickness of a tissue sample is an equally important determinant of effectively inactivating bacteria by cooking33. The liver, lymph nodes and kidneys are the filtering organs of the body, while the heart circulates the blood. The buffalo and kudu lymph node tissue had visible lesions characteristic of M. bovis and high numbers of the bacteria could increase the survival time of the Mycobacterium31. The positive results from the lymph node tissue agreed with those of the first study conducted on beef. Buffalo showed a higher recovery rate of NTM than kudu in this study, but it is unknown whether this is a coincidental or significant finding. It should also be noted that other game species utilised for human consumption may carry NTM and should be investigated. In summary, the findings of this study showed that the consumption of cooked meat from naturally infected buffalo and kudu, including lung, muscle, liver, lymph, kidney and heart tissue, poses minimal risk to humans of contracting bovine tuberculosis. It has, however, been shown in this study that cooked viscera from these species may contain NTM which can survive the cooking process. The findings reported here showed that the zoonotic threat from M. bovis through consumption of cooked meat from infected buffalo and kudu is minimal. Likewise, it was shown that an excessive drying process to produce biltong does not support the survival of M. bovis, but it should be emphasised that this does not necessarily include processing protocols that produce biltong with a higher water content. Of particular concern was the detection of NTM in multiple organs from 4 buffalo and 1 kudu. The zoonotic significance of this finding remains to be investigated in the light of an increasing awareness that NTM may affect human health, especially in immuno-compromised individuals. It is recommended that the game meat industry and health authorities should inform and educate the public and commercial market about the possible infection risk associated with consuming viscera raw (as a delicatessen) from especially buffalo but also kudu, as well as the correct processing of game meat. It is imperative that food outlets obtain game meat from sources where the necessary meat inspections are conducted to prevent meat unfit for human consumption from reaching the market. The authors thank Wildlife Ranching South Africa (WRSA) for their financial support, the assistance from office staff at WRSA head office and the executive committee of WRSA for their encouragement and other resources. Dr D Cooper, Chief Veterinarian: KwaZulu-Natal Wildlife, for his assistance and effort in collecting the research samples during their culling programme. Mr J L Bekker from the Tshwane University of Technology and Dr P. van der Merwe from the Department of Defence, Directorate Animal Health for their inputs during the initial study. In conclusion: our gratitude to the staff of the Tuberculosis laboratory in Onderstepoort for their supportive collaboration during the practical laboratory phase of the study.